The Tall Ships Festival was a roaring success in Waterford City and will have left a great impression on the many visitors of what we have to offer here in the City and in the region. It was mighty as they often say about fantastic events such as these. If you want to savour the event though pictures that we took then have a look at our 2011 Gallery. You can also look at the video below of the entire Tall Ships Festival in Waterford City in July....and see 2 of the crew, decked out in their finery and their ray-bans. Waterford Tall Ships 2011 from Nemeton Leiritheoiri Teilifise on Vimeo. 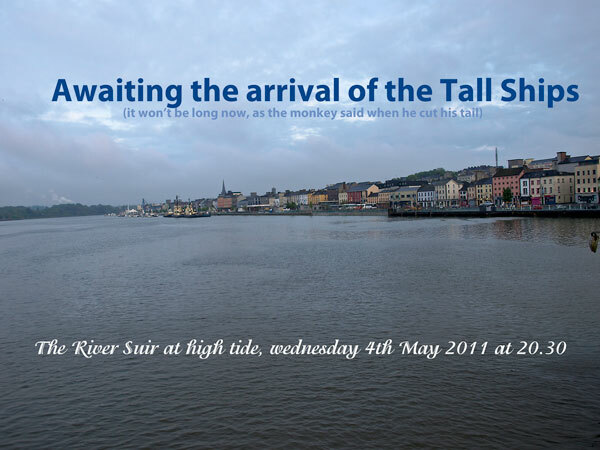 or, just as good, watch the time lapse photography of the River Suir and the activity around it as the boats arrive. Taken from the Granville Hotel (you may need high speed broadband to view this in comfort). Tall Ships 2011 from Aspect Photography on Vimeo. 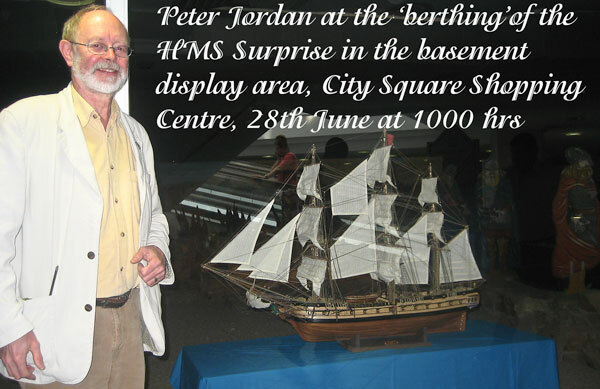 Peter Jordan very graciously offered his creation, HMS Surprise, to City Square Shopping Centre, where she is safely on display in the display area between the basement carpark and the main floor of the centre. If you get a chance it is worth a visit. A magnificant replica and well done to Peter for all his hard work. 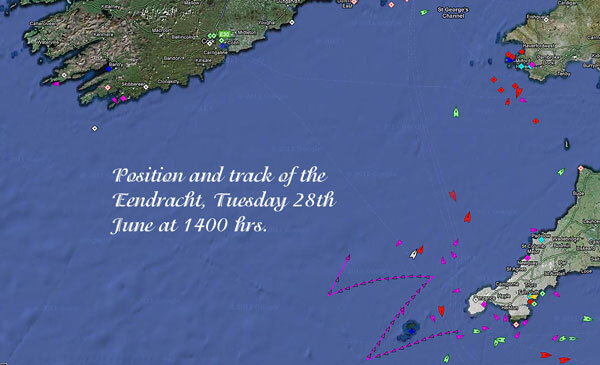 The Eendracht is one of the Class A Tall Ships visiting Waterford for the Tall Ships festival. This three-masted schooner was built in 1989 and she is a little over 55 metres in length. 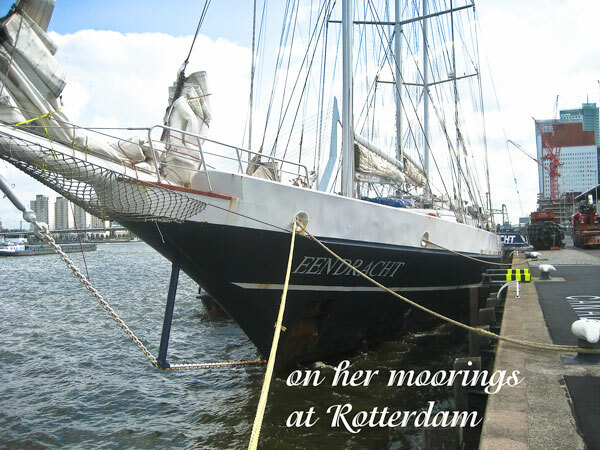 She is owned and operated by the Dutch Foundation and National Society 'Het Zeilend Zeeschip' and, as a sail training ship, she offers sail training for young people (mostly) throughout the year, but especially in summer when younger people, on school holidays, can sail on her. 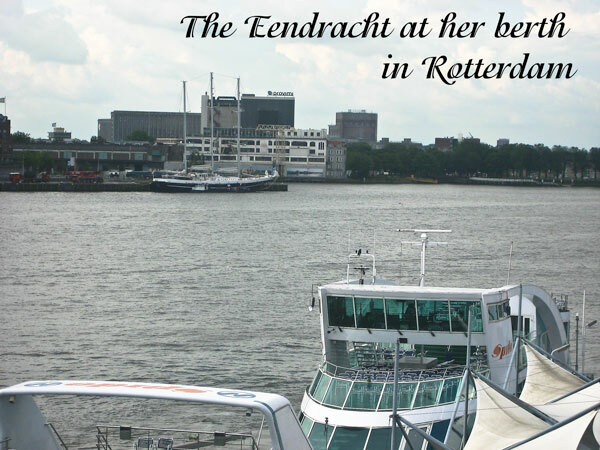 Her home port is Rotterdam and she is based near the New York Hotel. 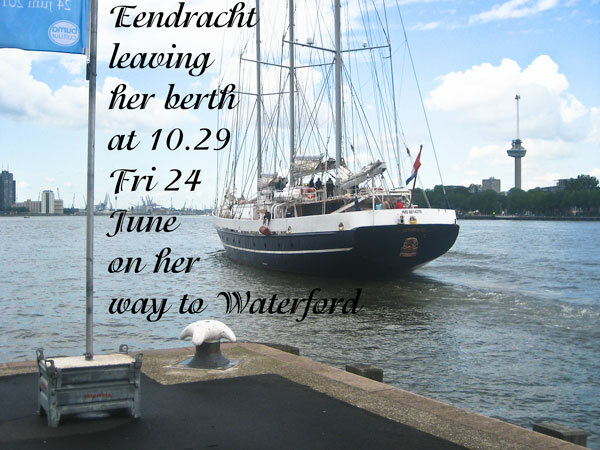 She left Rotterdam on Friday 24th June for the 7 day voyage to Waterford for the Tall Ships Festival and she had a total of 13 sail trainees on board, including 3 from Waterford (two females and one male) and 6 in all from Ireland. They were under the tutelage of 13 crew members, all volunteers and a fantastic voyage was in store for them. Mind you, it isn't a holiday as such, as each trainee will have specific duties to fulfill and will be expected to participate in all the ships activities, under the direction of the crew, many of whom have a lifetime of maritime experience under their belt. 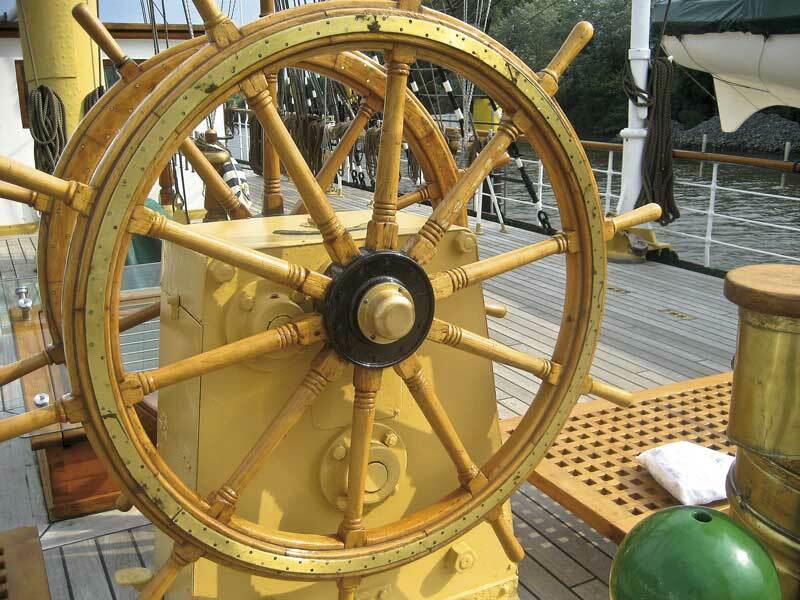 For example the captain is a retired ships captain but the former CEO of a large building firm in Holland has also gained valuable experience since his retirement seven years ago and is now the prospective Watch Officer. it was indeed a pleasure for this humble webmaster to cast her off her berth as she headed for Waterford. 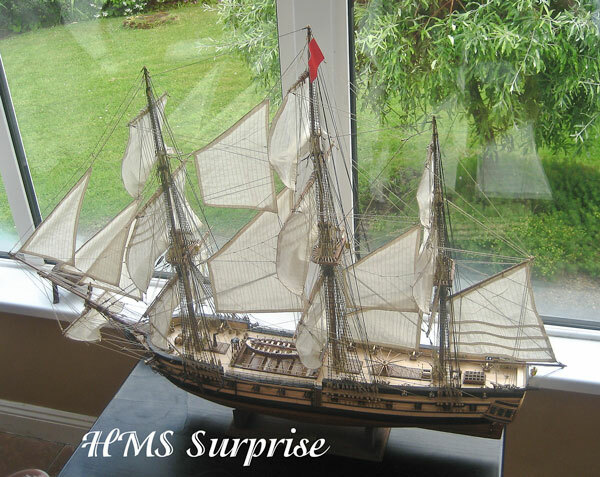 Launched today (18th June) to great fanfare in the suburbs was a model of HMS Surprise (1795), a fabulous piece of work and craftmanship, which took 2 years to complete, and to the delight of Peter Jordan, its creator, who regaled those present at the launch with tales of the ship itself and the difficulties encountered in its construction. 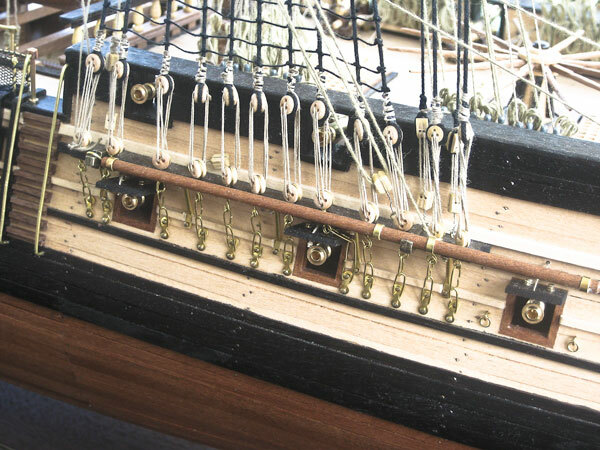 The model will be on display in the City somewhere during the Tall Ships Festival and will surely catch the eye of those lucky enough to see her. Also present at the launch was John O'Connor who has an exhibition of fine photographs of Galway hookers in Waterford Regional Hospital and which will run during the Tall Ships Festival. Galway hookers are traditional workboats of the west of Ireland and were used to carry supplies, turf mainly, between the mainland and the Aran Islands. 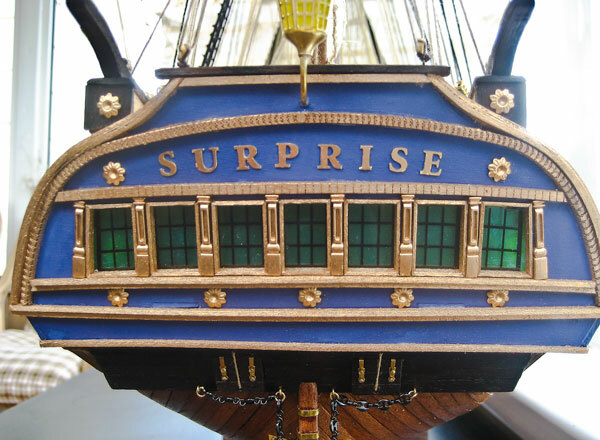 There is so much happening during the Tall Ships festival that it will be hard to keep track of every event but there is definitely something there for everyone. The Berthing Plan for the many ships that will arrive in our City has been published and we show a condensed and low resolution version of it here. 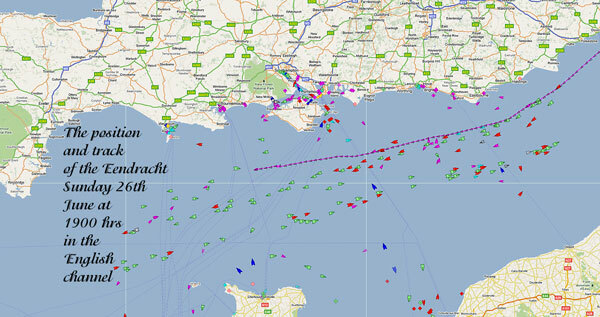 For the full hi-res version click on Berthing Plan. Waterford City is in the grips of Festival fever as it prepares for the arrival of the Tall Ships in just two weeks time. There are all sorts of activities going on along the Quay to prepare for the many visitors expected over the four-day festival. Many of the buildings along the Quay are being painted and new paths are being laid in places so that our beautiful Quay will be in tip top shape for the Fetsival. Bishop's Palace is due to open on the 22nd June and what a spectacle this will be, not just for the Festival, but thereafter, and will be an important component of the Viking Triangle, which is nearing completion. The river Suir too is being readied for the small, the big and the all sizes in betweenTall Ships that will grace its shores soon. The berths are being prepared and strengthened and the river is being dredged so that the very biggest Tall Ships will have unimpeded access to the quayside. Meanwhile the Official Souvenir Brochure of the Tall Ships Festival has been published and is available locally now. It will also be on sale during the Festival and it is an attractive publication, full of facts about the Tall Ships arriving for the Festival. It also lists all the Festival Acts so it is a must buy for anyone wishing to enjoy the Festival activities, be it visiting the Ships themselves, listening to the musical events or participating in the fringe events that are taking place throughout the City during the Festival. The very attractive map at the end shows all the Festival locations, where to eat, drink and be merry during the Festival. 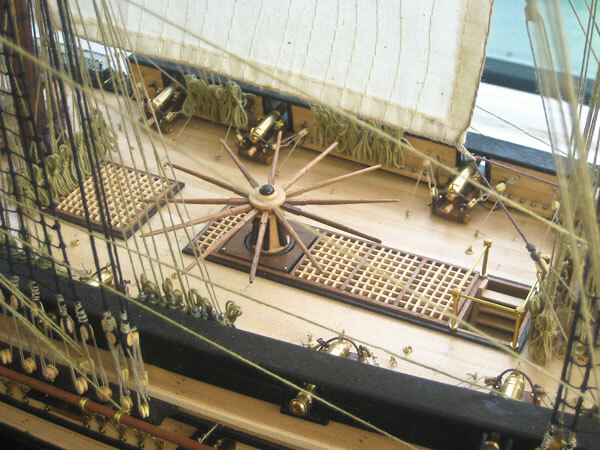 As part of The Tall Ships Races, Waterford Institute of Technology and The Tall Ships Races 2011 have come together to organise two competitions for Secondary Schools in the region. The purpose of the competitions is to give students the opportunity to learn about and participate in The Tall Ships event. The competitions ask students to develop either an art piece or a written composition. If you have children yourself or know some children who fall into the category of secondary school going age, please encourage them to submit a competition entry. The closing date is extended until Friday the 20th of May 2011. With an expected 500,000 people in the City for the Tall Ships Festival at the end of June, the Mayor, the local Chamber of Commerce and Fáilte Ireland are calling on all sevice providers to maintain a fair pricing policy during the Festival and offer visitors to our City value for money in everything they buy or consume. Such a fair pricing policy could have lasting implications locally and regionally if, as expected, a proportion of these visitors return when the Tall Ships have sailed. Waterford is hoping to capitalise on the carbon-neutral footprint of the Tall Ships when they visit the City in a few weeks time. The City is calling on all on businesses of all sizes and in all sectors to embrace the Greening of the Tall Ships 2011 in an effort to save on energy, waste and water costs and so assist in reducing their environmental impact locally, nationally and globally. 100 DAYS to THE TALL SHIPS RACE, There are now less than 100 days left before the arrival of the Tall Ships to Waterford, when over 70 of these majestic boats will grace our shores and the beautiful Quay in the City. 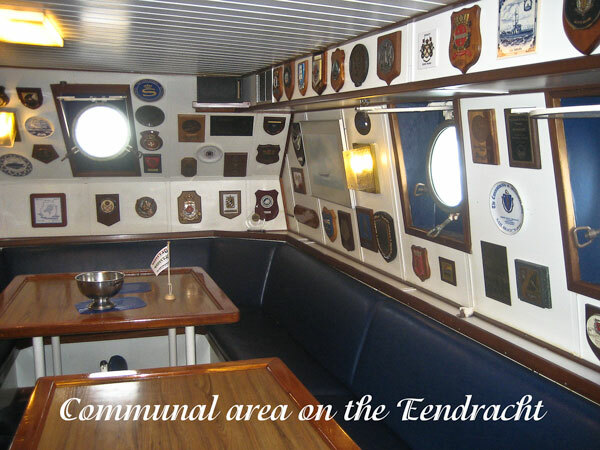 We look forward to welcoming, among all the rest, the Christian Radich and the Royalist, both 'A' class boats and the oldest boat of the fleet, the Provident. 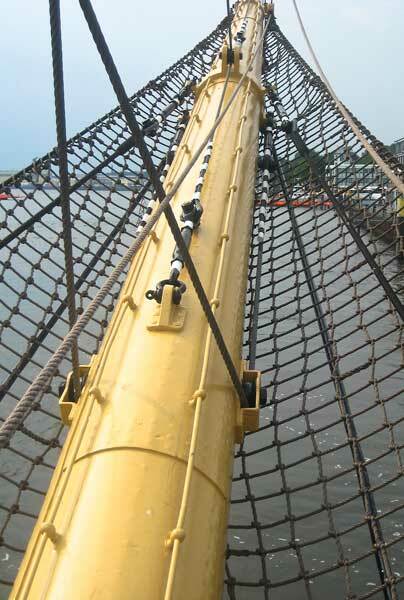 http://www.afloat.ie/sail/tall-ships/item/15203-100-days-to-waterfords-tall-ships/ So book your holiday in the City as soon as you can. Brian Ferry, a fantastic musician with a string of hits, and front man of the band Roxy Music, has been added to the growing list of celebrated musicians who will perform during the Tall Ships Festival in Waterford. Brian will perform on the opening night of the Festival, Thursday 30th June. A gig to look out for and remember all the gigs in the City for the Festival are free and open to all. Headline acts (apart from Hooks and Crookes! ), which have been booked for the Tall Ships include the Waterboys who will play on Friday 1st July and local group O Emperor who play on the same night; Sharon Shannon and friends will play on Saturday 2nd July to the huge audiences that are expected for this extravaganza of Tall Ships, people and craic. 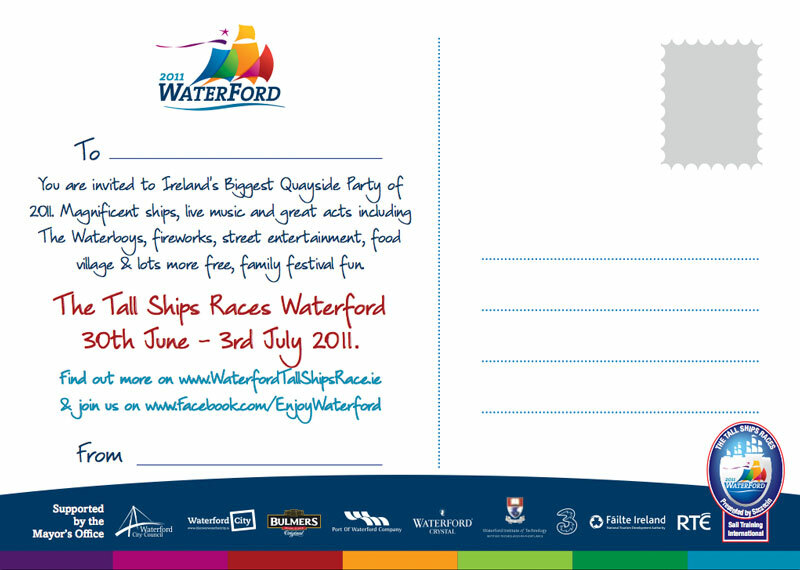 Over 150,000 postcards have been distributed in the last week to people and places all over Waterford to encourage people to invite whoever they know to visit the City for The Tall Ships Race from 30th June-4th July this year. The Mayor of Waterford, Cllr Mary Roche spearheaded this campaign and was one of the first people in the City to post out these colourful postcards. 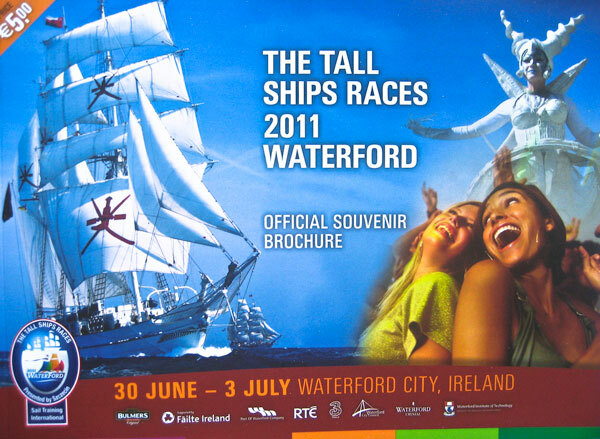 Are you interested in the provision of portable toilets, showers and cabins for the Tall Ships Festival in Waterford City from the 30th June-4th July. Deadline is the 10th February for submissions of interest.